After another long and spectacular train ride, we arrived in the beautiful riverside city of Irkutsk. Having had images of ugly, grey soviet buildings clouding our idea of a Russian town, Irkutsk was a pleasant surprise. With a Europe-esque look and vibe, Irkutsk deserved more time than we had to explore. We had a day to walk around and check out some of the beautiful churches around town. 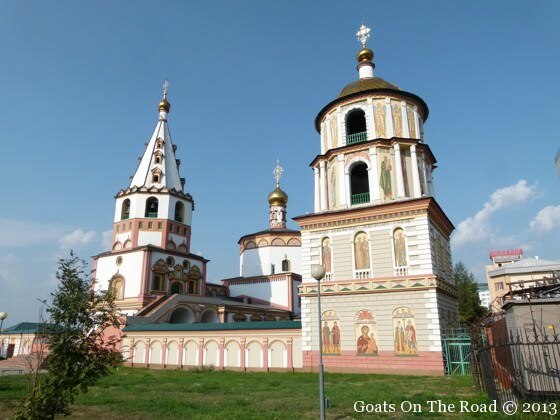 Upon entering the churches and seeing the ongoing, ceremonious prayer, it was immediately evident that Russia holds on strongly to its religious roots. 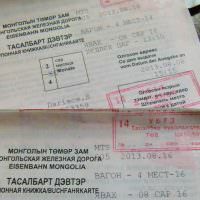 After just 15 hours in Irkutsk, we left on the morning bus (7hrs R700) to Olkhon Island. 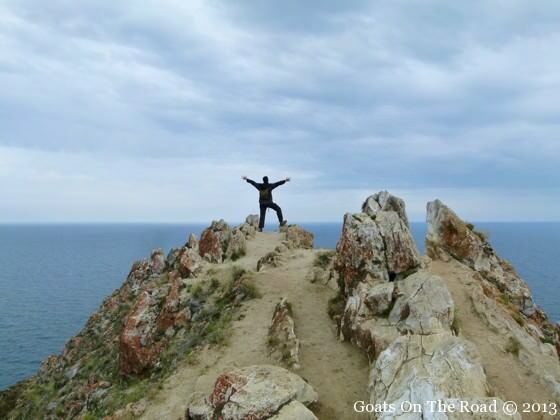 Olkhon island is a 72 km long piece of paradise and is said to be one of the 6 epicenters of earths’ shamanic energy points. 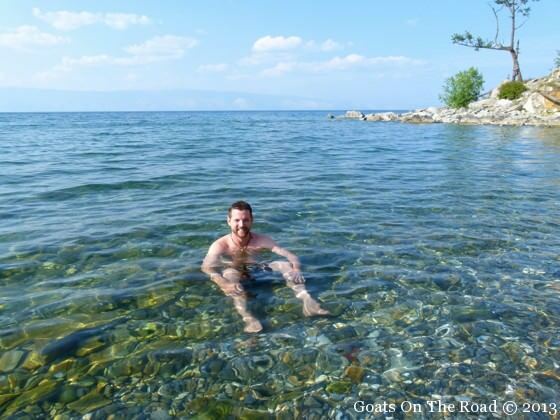 The island is set on dazzling Lake Baikal, which is the deepest lake in the world at over 1,600 meters deep in some places. This single body of water holds an astonishing 1 fifth of the world’s fresh water. As we rounded the first bend that gave us a view of the island, we could see why so many people had recommended that we come to this place. We took a small ferry over the crystal clear water that is so clean, it is said that you can drink it straight from the shores. Even as we came to the centre of the small peninsula, we could still see the bottom, which was probably 50 or more meters below us. The first day on the island we enjoyed the sun and the warm weather, which had managed to escape us while trekking in Mongolia. We laid on the beautiful beaches and bathed in the warm sunshine. 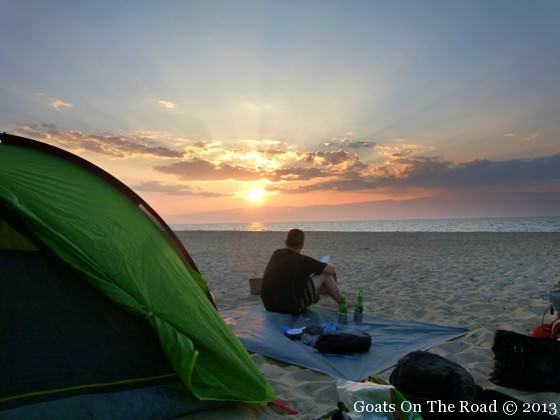 That first night we found a nice spot on the sand and camped under the stars (camping is free and legal on all of Olkhon’s shores). Olkhiin island is the holiday spot for many Russians so we were surrounded by joyful locals enjoying their summer vacation. 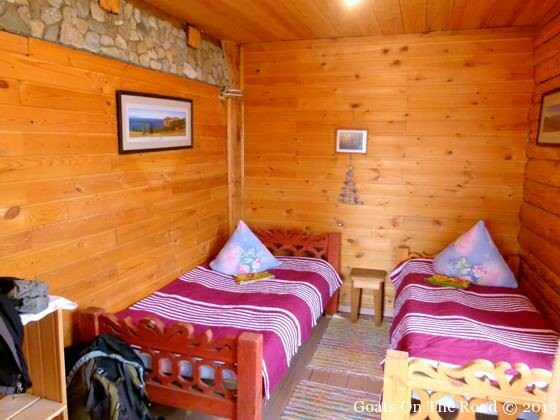 The next day we checked into Nikita Guest House (R950/person w/Full Board +20mins free banya). 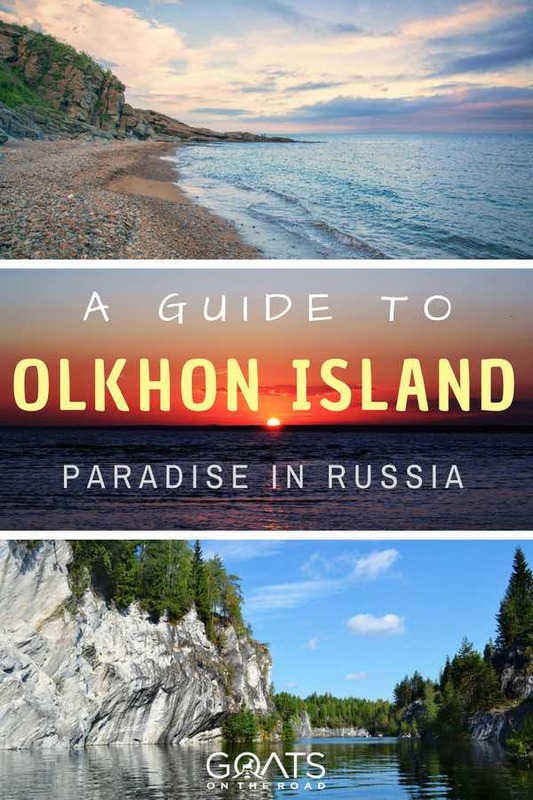 This massive complex is a mecca for travellers visiting Olkhon Island and they can arrange everything from day trips to weekend excursions around the island. The cost of Nikita would normally be over our budget, but when we saw the smorgasbord of local cuisine on offer, and our clean comfortable room, we realized that it was a great deal. We spent another entire day relaxing on the beach and swimming in the clear (and very cold) waters of Baikal. We almost got a tan! After a night in Nikita, the bad weather caught up to us again. Unfortunately we had planned our excursion on this day (R800pp 7hrs w/lunch) and as we boarded the Russian van to head to the north of the island, our eyes were looking cautiously to the dark sky. Luckily only a small drizzle fell from the sky as we explored the dramatic cliffs of Cape Khoboy on the northern tip of the island. 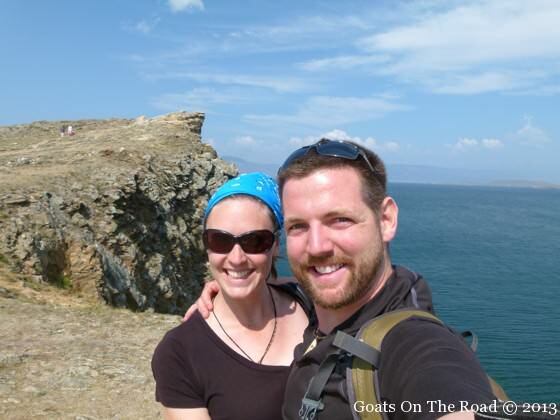 We did a few hikes to some amazing lookouts where we had full panoramas of Olkhon and the surrounding Baikal. After our tour, we came back just in time for a delicious dinner of Omul (local Baikal fish) borsch and potato salad. 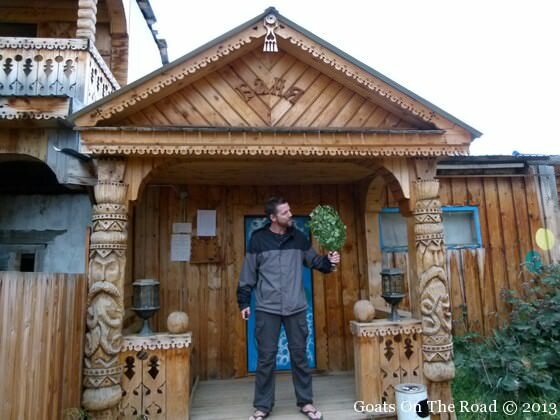 After stuffing ourselves we headed for the Banya (Russian sauna/bathhouse) where we beat ourselves with eucalyptus branches and sweated it out for 40 minutes. 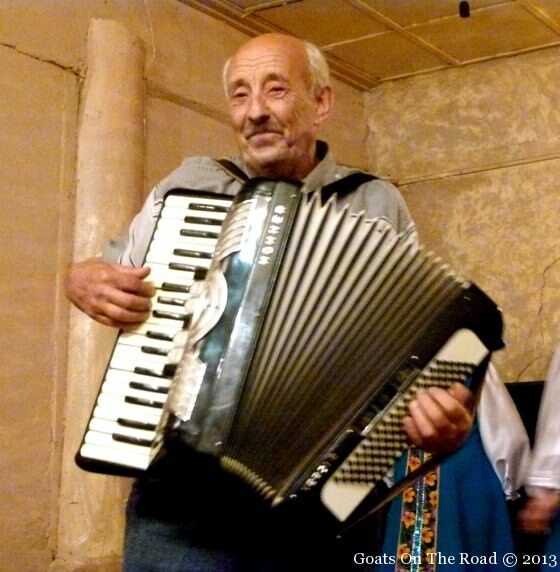 As we left the banya, hot and refreshed, we noticed an old man playing the accordion outside of Nikita’s music hall. Turns out we were just in time for a local musical show. We sat in the hall and listened to the band play traditional songs from the various regions of Russia and Europe. The old man on the accordion was the most charismatic Russian we’ve ever seen and he played off the crowd like a rock star. 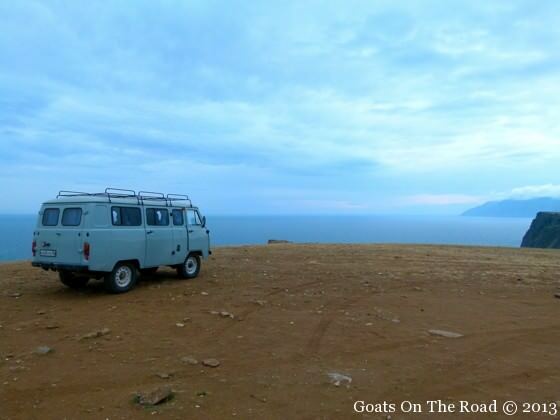 It was a great end to a perfect stay on Olkhon Island. 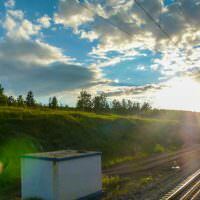 After 3 nights on the island we had to leave to get back to Irkutsk for our train to Omsk. We loved the island and although we had heard travel tales of its beauty, we were still amazed by how gorgeous it really was. It’s unfortunate that the nature of this trip requires planning far in advance, because if we had more time, we would have stayed on this mesmerizing piece of paradise. 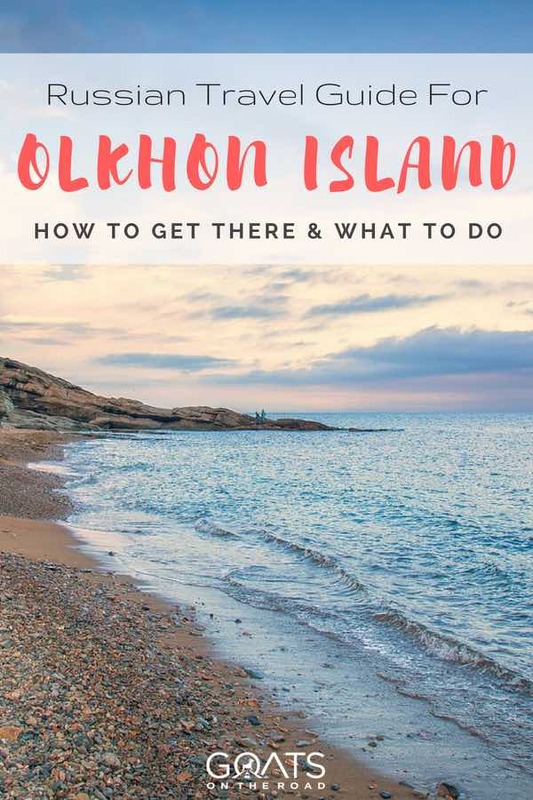 Check Out Our Olkhon Island Video (7mins)! Love, love, love the video. My favorite part was you guys waking up on the beach, paradise just beyond the flap of your tent. Amazing! Makes anyone yearn to travel. Keep it up, you inspire so many! It was one of the best mornings ever…sun shining into our tent, the water lapping up on shore, no one awake yet, loved it! Looks like a lovely trip! I hope ours will be as nice as yours, we’re going for a trans-Syberian railroad cruise with Travel all Russia in couple of months, I’ve read all about it and it should bring unforgetable experience. Loved your blog, I felt that good Russian spirit! I loved this video! 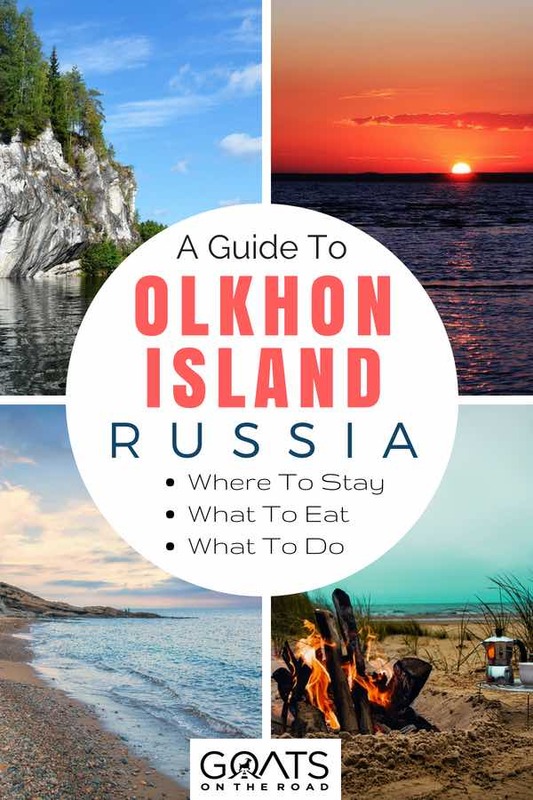 Me and my boyfriend are going to Olkhon Island this summer as a part of a journey on the Trans Sibirian Railroad, and since we want to do a lot of camping in tent, I was wondering if you had your cooking equipment/gas cooker with you all the way from home, or if you bought it during your trip? I would guess that we’re not allowed to bring it on our flight to Russia. Thanks for an amazing and inspirational site!